In a moment that caught the art world by surprise, Banksy’s Girl with Balloon self-destructed just as the final hammer signaled the end of an evening of auctions in London. The work sold for £1,042,000 ($1.4 million), tying the artist’s record in pounds at auction previously achieved in 2008. 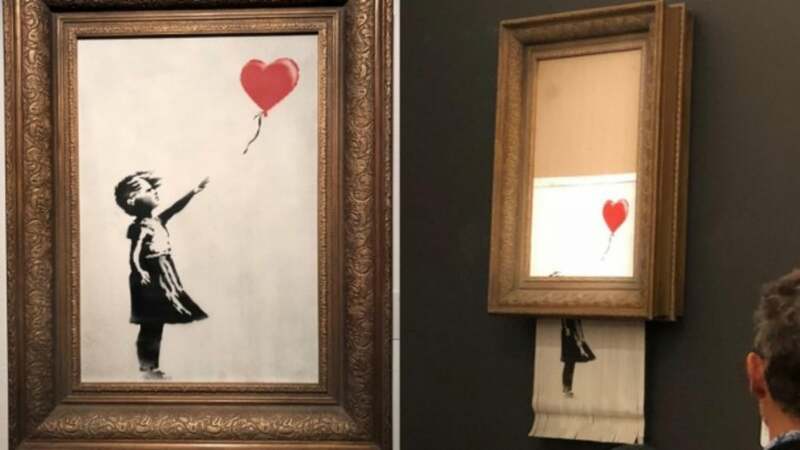 The framed work, spray paint and acrylic on canvas, mounted on board depicted a girl reaching out toward a bright red, heart shaped balloon – one of Banksy’s most iconic images – began to pass through a shredder hidden in the frame. BANKSY, GIRL WITH RED BALLOON, 2006. SOLD FOR £1,042,000 ($1.4 MILLION) “It appears we just got Banksy-ed,” said Alex Branczik, Senior Director and Head of Contemporary Art, Europe London. The unexpected incident became instant art world history and certainly marks the first time in auction history that a work of art automatically shredded itself after coming under the hammer. Led by Jenny Saville’s monumental work Propped, which established a new auction record for a living female artist, the evening of Contemporary Art auctions brought a combined total of £68.7 million. The 25 artworks offered from the collection of the late David Teiger, the visionary collector, patron and museum trustee, were 100% sold for an overall total of £35.9 million.